Rebecca Schull and Christian Campbell in The Green Book. Photo by Rahav Segev. Four new one acts lead you to smile in recognition across cultures (Lessons for an Unaccustomed Bride), laugh at absurdist brilliant commentary and situations (Some Women in Their Thirties Simply Start to Fall), feel social pressures that seem current and yet distant across a several decade remove (Clap Your Hands), and tear up at adult children coping with one parent’s memory loss and another parent’s destruction by the weight of memories uncovered (The Green Book). Lessons by Jose Rivera provides a two act coming-of-age story of a young sheltered bride seeking advice from a witch in her island Catholic community. Mayra (Shirley A. Rumierk) and Yessenia (Socorro Santiago) discuss faith, truth, hope, love. Yessenia has a back story that led her to lose her own Catholic faith, while Mayra is youthfully and simply and earnestly full of that faith, with questions. There is poetry in their discussions. Yessenia notes of the Bible that “words in that book are clouds my dear — when you look at cloud you see exactly what you want to see.” Yessenia, who has suffered some dire losses in her life, comments on the costs of vulnerability in life: “love is when death’s worst work is done”. Poetry in the islands and wisdom passed from woman to woman. Tina Howe writes of the mind-body divide in Some Women with absurdist deliciousness — yes one actress plays character Charlotte “whole” and as just her “head” when positioned behind some packing boxes (Crystal Finn), and another actress Kate Geller plays Charlotte’s “body” stumbling around the stage. Charlotte attempts to make sense of her life through this physical phenomenon while on the streets of the Upper West Side and a Dr. Singh (Ryan Shams) comes by immediately (it’s absurdist comedy, you have to roll with this) to deal with the flailing and cart the pieces off. The most sustained entertainment in this piece is the commentary and engagement provided by two neighborhood characters Rene (Kathryn Grody) and Howard (Arthur French) who analyze, laugh, find each other, talk about their families, allow us as the audience to process these wild events as just another wondrous day on the streets of New York. Waltzing at the Waldorf on New Year’s Eve in evening wear provides the context for Clap Your Hands. Two men who work together and their wives who barely know each other reveal, argue, dance, and ultimately stare off into their futures. The older couple Joel (Victor Slezak) and Stella (Meg Gibson) live out a tradition that was established for them years before and neither particularly enjoys. The younger couple Anson (J.J. Kandel) and Paula (Megan Ketch) work out lurking resentments and secrets, fueled by champagne. Paula speaks truth through bubbly. The ride works, the characters are distinct and evocative, and the final moments riveting. The post-intermission longest piece on the bill, The Green Book, directed and written by Will Scheffer is in part a story about sibling resentments, in part a story of aging parents, and in other parts stories of past crimes of war, culture, relationships. To discuss the details of the plot and the meaning of the title would give away a key detail of interest in the play. 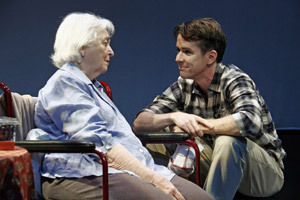 The weaving of these weighty themes is a bit uneven and sometimes inelegant at this point, but there are many winning moments provided by matriarch Sheila (Rebecca Schull), her children Ben (Neal Huff) and Franny (Jodie Markell), and especially Ben’s long time partner Sam (Christian Campbell). Mama’s perhaps dementia-influenced phrase uttered to all who come near her — “I think of you often” — develops a resonance and power through repetition.